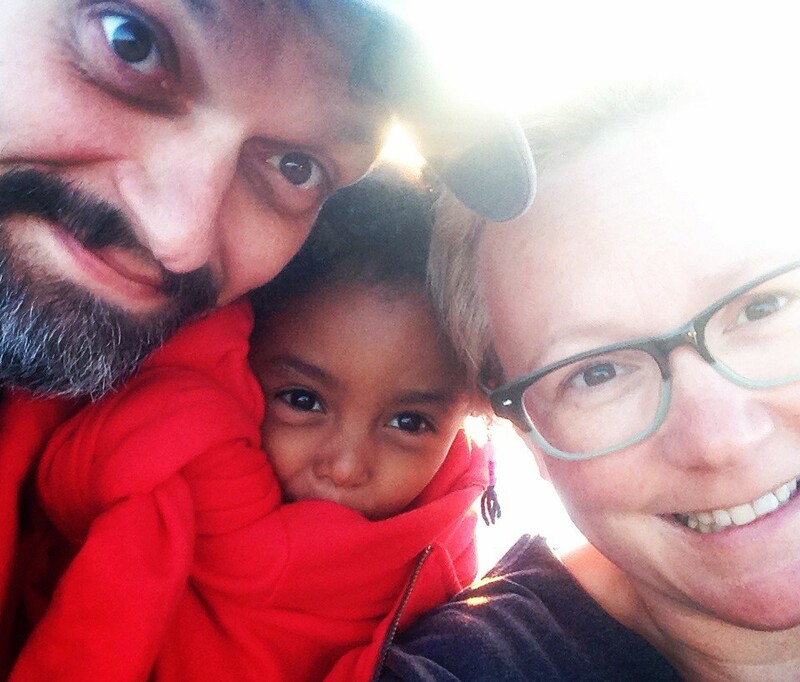 Our fist year of a family of three I had a holiday crisis of sorts. We were making a huge deal over Davy’s first Christmas but less so of Davy’s first Hanukah. It was really more of a crisis about how you raise your child, born in Africa in a culturally Jewish/Non Jewish home. I have a friend from high school who is gifted with spiritually and wisdom. 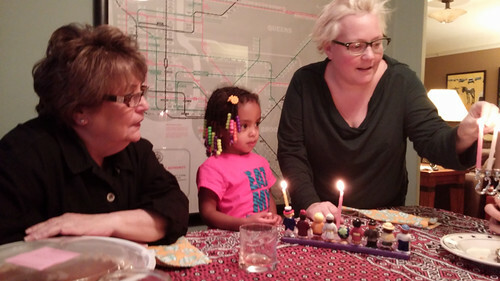 She is an adult adoptee and practicing Jew and really (HINT) should consider becoming a Rabbi. If she was my Rabbi I would go to synagogue. Fact. Read her blog. You will want her to be your rabbi too, even if you aren’t Jewish. She told me to calm down. That we get to make the rules. We get to say what is Jewish and how we want to bring that into our home. That I need to let go of my preconceived notions and baggage of my semi-religious upbringing. To let go. To make new traditions. Davy will love what ever we do. 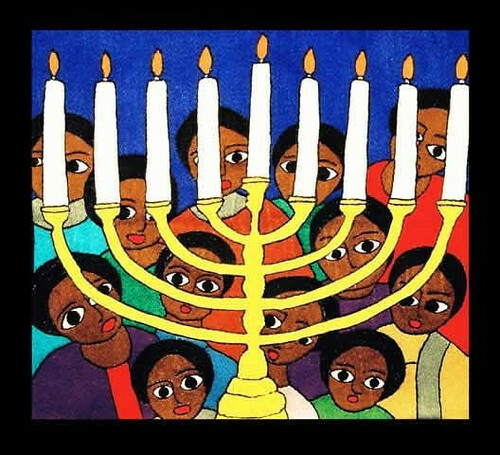 That year my mom found the worlds greatest kid menorah. 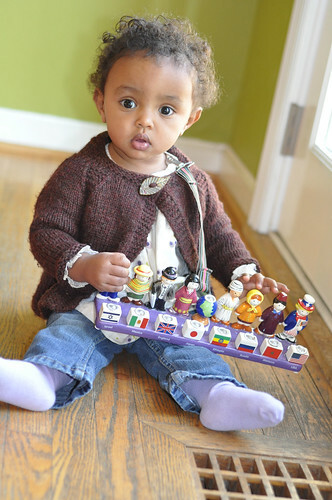 It has children from around the world, and even includes Ethiopia. This year Hanukah fell on Thanksgiving and two weeks after Davy’s third birthday. I really didn’t want to do MORE gifts. The kid has toys coming out of her ears and frankly, it felt disingenuous to just throw more stuff at her. So we kept it simple. We just lit the menorah and said the prayers. You know what? It was magical. Davy tentatively says the prayers with me. She got to pick the candles and the “guys” she gets to lit. She always chooses the Ethiopian guy. 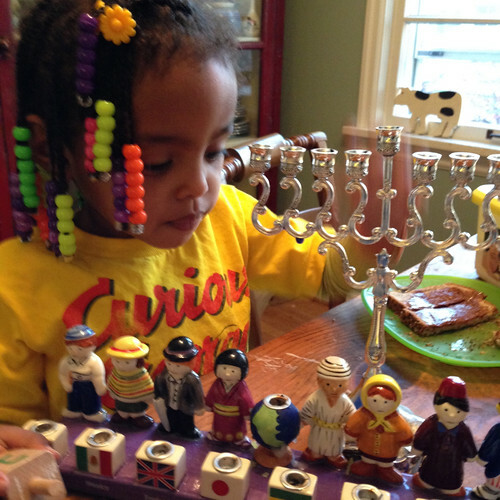 She loves looking at her Menorah. The one that her Baba gave her. It makes me happy. For years I felt so conflicted about my upbringing. We are keeping it simple and she loves it. Thank you my Leslie for releasing me of my weird childhood version of Judism and giving me the notion that we can just do it the way we want to. Really. Thank you. Another wonderfully unexpected thing that has happened this year is that my friend Courtney has giving me a very special gift for Hanukah. 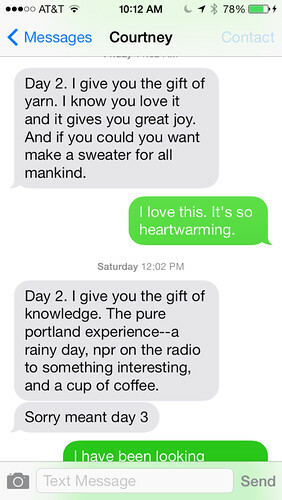 She has given me 8 days of wishes via text message. It’s funny and sweet and random and kind and I love getting it everyday. I will be sad when it ends because I really do cherish them. It’s like an afermation that comes all the way from Southwest Portland. Thank you a million and one times Courtney. They make me laugh and feel loved. 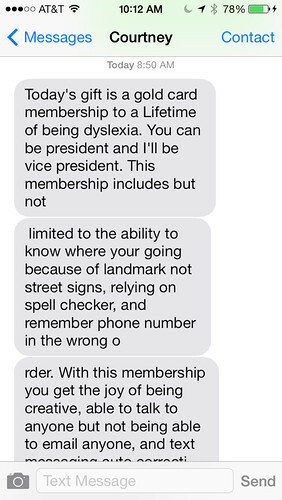 I can’t wait for Davy is old enough to appreciate 8 days of text messages from her mother, because I plan on keeping this as a family tradition. So there you have it. A lil’ bit of Judism and lots of gratitude and TWO blog posts in 2 weeks. Happy season of gratitude. I agree with Leslie. Judaism is what you make it, and creating your own traditions is fantastic! Your grandfather would kvell. And I love the eight texts. Very clever. I am going to try that idea!